You are currently browsing the daily archive for 09/03/2017. We continue our occasional series, ‘Inside the Mind‘ with responses from Mike Parker Pearson, Professor of British Later Prehistory at the Institute of Archaeology, University College London. Beginning his archaeological career in 1972 working on archaeological excvations in southern England, he has since worked on archaeological sites around the world in Denmark, Germany, Greece, Syria, the United States, Madagascar, Easter Island (Rapa Nui) and the Outer Hebrides. After gaining a BA in European Archaeology at the University of Southampton in 1979, he was awarded a PhD at the University of Cambridge in 1985. He worked as an Inspector of Ancient Monuments for English Heritage until 1990 and then as lecturer in the Department of Archaeology & Prehistory at Sheffield University. In 2010 he was voted the UK’s The Archaeologist of the Year by the readers of Current Archaeology magazine. 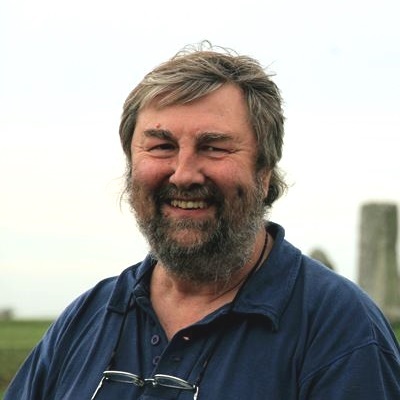 Best known for his work at Stonehenge in the ongoing and evolving projects; Stonehenge Riverside Project, Feeding Stonehenge and the Stones of Stonehenge, his most recent research has been focussed on West Wales, where Stonehenge’s bluestones were quarried. What sparked your interest in Archaeology/Heritage Protection? At 4 years old I discovered fossils in a heap of gravel and learned that the past was mysterious and fascinating. I had a good teacher at junior school and, years later, my geography teacher even drove me on the day I left school to an excavation and to begin my full-time life as an archaeologist. There’s no one person – I was lucky to be taught and inspired by a generation of archaeologists at the top of their game – both practical and theoretical, field and lab, and humanities and science-based. Which has been your most exciting project to date? I always think the thing that I’m doing now is the most exciting – right now, I’m focused on the sources of the bluestones in Wales, which might just give us an insight into the origins of Stonehenge. I did enjoy the years digging in the Outer Hebrides – great archaeology (not properly appreciated), great colleagues and a wonderful place to work without all the bureaucratic difficulties we had to cope with in the Stonehenge World Heritage Site. What is your favourite British archaeological site… and why? It’s a toss up between Cladh Hallan in South Uist (an unusually well-preserved Bronze Age to Iron Age settlement in the Outer Hebrides with skeletons under the floors that turned out to have once been mummified) and Durrington Walls, with its houses, middens, unsuspected avenue and giant post circle. What is your biggest archaeological/heritage regret? When I was Inspector of Ancient Monuments at English Heritage in the 1980s we had to allow the Bedford Bypass road scheme to preserve in situ some Neolithic cursus monuments underneath a road embankment. They are probably buried under that road forever – inaccessible to any archaeological investigation – and I now wish that they had been excavated. I’ve become rather more sceptical about ‘preserving in situ’ underneath modern development where the remains are inaccessible for the long term. If you could change one thing about current heritage protection legislation, what would it be? Contracts for archaeology in advance of development shouldn’t go to the lowest bidder but to the best bid – it shouldn’t be the developer choosing the contractor on the basis of who is cheapest but the planners choosing on the basis of the best research design (as has been the rule in Sweden for years). If you were able to address Parliament for 30 seconds on archaeology what would you say? Right now, it’s the A303 at Stonehenge. The proposed tunnel is way too short and would damage the WHS irretrievably. There’s a second option that avoids the WHS and is cheaper, too. If your career hadn’t worked out, what would you be doing now? At school, my careers teacher tried to get me to drop my interest in archaeology, which he was certain would not result in employment, and tried to get me into law and business management. Glad that didn’t happen. I think I would be good at doing bacon sandwiches at a greasy spoon or running a cattery. Away from the ‘day job’, how do you relax? Watching TV with the cat while eating bacon sandwiches. As always, we’d like to express our sincere thanks to Mike for taking time out of his busy schedule to answer our questions. Previous articles in this series can be found here, or by using our Search Bar, and the term ‘Inside the Mind’. If you work in community archaeology or heritage protection and would like to take part, or have a suggestion for a suitable and willing subject, please contact us.